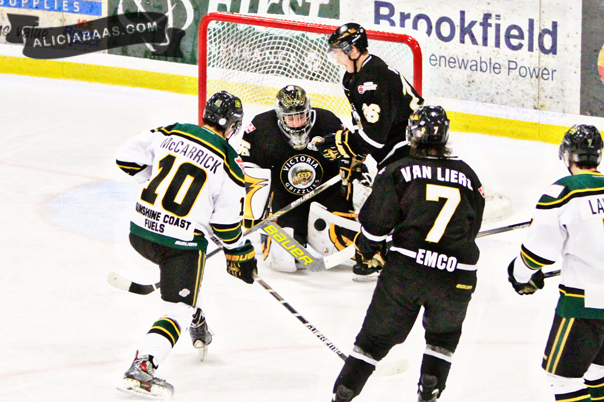 The Kings had a 5-game win streak snapped on Sunday against the Victoria Grizzlies, a 4-1 score. The Kings also had a 7-game streak of earning at least a point on Sunday, that one dating back to November 10th also against Victoria. Trail are starting a 3-in-3 through the Island Division. They’ll hit Alberni and Cowichan tomorrow and Sunday before a long trek back home overnight on Sunday and into Monday. The team is coming off back to back wins at home last weekend, shutting out Alberni 1-0, then beating Wenatchee 4-2 at Cominco Arena. Again no Betts or Turnbull this weekend for the Kings, and next as well. The pair made Team Canada West, which means they’ll be out of the Kings lineup until after the Christmas break, missing a total of 7 games including the pair last weekend. Expect re-inforcements from the Island and the Kings network of affiliates which they take great pride in maintaining and using at various points throughout the season. Certainly Sunday’s loss still stings, especially against a team that the Kings blew out of the water the night prior. The excuse will certainly not be used that the Grizzlies had travel legs on Saturday and were fresh Sunday (although that arguement’s already been made), quite simply the Kings slipped back into some bad habits after apparently kicking them after the November 10th loss to Victoria. It’s been a big week in practice as this team wants hit the Christmas break on a high note, instead of limping in like can so often be the case (not just with the Kings, but league wide). It’s a big distraction as players who haven’t been home or seen family in months can sneak their minds ahead 2 weeks and an 8-day break. There’s 5 games to go first, and 10 points on the line that the Kings quite honestly need if they stand a realistic chance of finishing the Division on top come March 1st. While no-one expects Nanaimo to run the table, despite being on an impressive 9-game win streak, the Kings need to keep touch and lost their grip on 1st by 2 points with Sunday’s result. With 3 games in hand (6 potential points), the Kings are currently 8 back of the Clippers who they will see a lot of in 2016. In net, it’s hard to ask for much more than what Jeff Smith is giving. He’s been a routine topic of conversation in the post-game show and even joined us upstairs a couple of weeks ago. Stefan Wornig is back from Team Canada West camp and will be looking to stake his claim for ice time. He hasn’t played in Kings colours since November 1st with Smith’s hot play keeping him sidelined. Do we see him this weekend? Trail travelled down yesterday as it’s nearly impossible to do a game day trip to Powell River from Cranbrook. That means the Smokies slept in their beds at the hotel last night, had an early game day skate today and will be 100% into tonight’s game. In net, Bailie MacBurnie will likely get the start in leg 1 of a road trip. He’s a former BCHL Player of the Week from earlier this season and has the bulk of Trail’s starts this year, posting a 9-3 record in 24 appearances. Up front, all the big guns are here and healthy. Much like the Kings, the Smokies don’t boast that high scoring sniper in the same manner of a Brayden Gelsinger (Victoria) who is alone and away in point production. Nick Halloran (25) and Jake Kauppila (20) lead the way, with former Eagles captain Kyle Star (17) and 4th year BCHL’er Harlan Orr (18) also up there. Also watch for Connor Brown-Maloski, who has been impressive with both Salmon Arm and Trail when the Kings have played either club. Plus big defenceman Cooper Leitch, who is a former Prince George Spruce King. What this Smokies lineup lacks in potent scoring, they make up for in experience. 7 rookies skate with the club, not including both netminders. The broadcast goes live on 95.7 Coast FM in Powell River at 6:55pm. It will also be online on the Kings Broadcast Network and FastHockey PPV. In our pre-game show we’ll talk with Kent Lewis about the news that Betts and Turnbull will be missing until after Christmas, plus what the week in practice has been following Sunday’s loss to Victoria. We’ll also talk with Smokies Head Coach Nick Deschenes about his team’s first half, and where they need to improve to get past Vernon and into the playoffs. In the 1st intermission, we’ll have chats with Mitchell Hawes and Rylan Ball. In the 2nd break, we’ll air John Grisdale’s appearence on TSN Radio earlier this week. Brock Sawyer will join us after 60 in the post-game show. 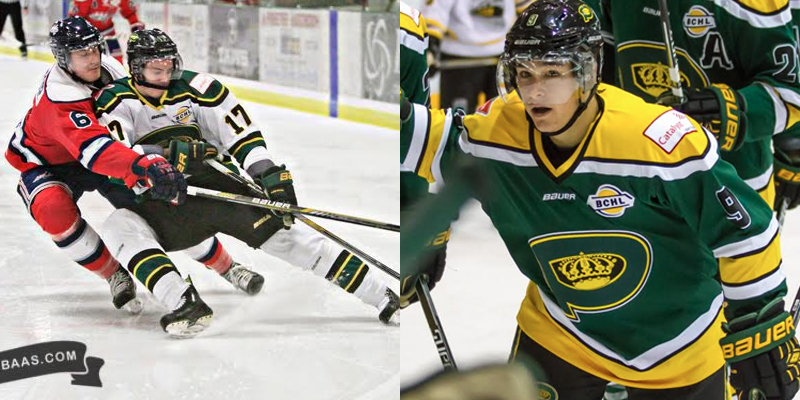 The Powell River Kings will again have representation on a global stage as both Kyle Betts and Carter Turnbull will join the team in Ontario and represent the BCHL at this year’s World Junior A Challenge. It continues a long history of Powell River participation in the event, which included Kurt Keats captaining Canada West last year, and Kent Lewis, Sean Maguire and Evan Richardson winning gold in Langley in 2011. The tournament begins Sunday with a preliminary game against Czech Republic. The full schedule is available here. The 22 players who will represent Team Canada West at the 2015 World Junior A Challenge in Cobourg and Whitby, Ont., have been named. Hockey Canada and the Canadian Junior Hockey League announced that two goaltenders, seven defencemen, and 13 forwards will make up this year’s Team Canada West roster, which meets the Czech Republic in the tournament-opener on Sunday, Dec. 13 at 1 p.m. ET at the Cobourg Community Centre. The final tournament roster was chosen by Fragle (Sherwood Park, AJHL) along with assistant coaches Paul Dyck (Steinbach, MJHL), Mike Reagan (Flin Flon, SJHL) and Barry Wolff (Coquitlam, BCHL), and director of hockey operations Trevor Alto (B.C. Hockey League). Players named to Team Canada West were selected from the CJHL’s five western Junior A leagues: the British Columbia Hockey League (BCHL), Alberta Junior Hockey League (AJHL), Saskatchewan Junior Hockey League (SJHL), Manitoba Junior Hockey League (MJHL) and Superior International Junior Hockey League (SIJHL). An exhibition game featuring Team Canada West going head-to-head against Russia will take place on Dec. 11 at 7:30 p.m. ET at the Duncan McDonald Memorial Gardens, home of the OJHL’s Trenton Golden Hawks. Tickets to the exhibition game are available for $10 at the arena box office. 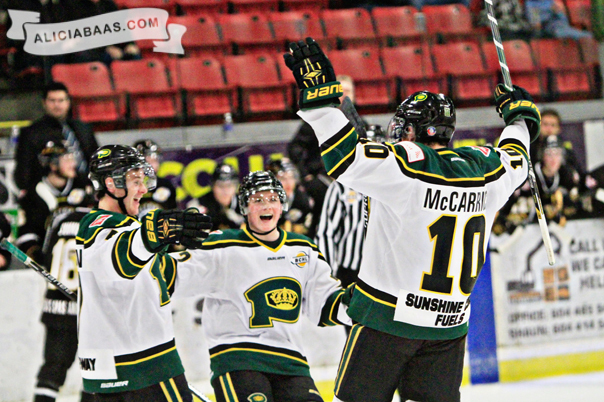 The Kings are coming off a weekend sweep of the Cowichan Valley Capitals, wins in their last 4 games and points in the team’s last 6 dating back to a November 10th defeat at home to the Victoria Grizzlies. While the Kings slipped to 3rd in the Division on Friday night, the Kings hold 2 games in hand over Cowichan (1 point up) and 3 in hand over the Nanaimo Clippers (6 points up). The Victoria Grizzlies have begun to turn their horror start around, and are now up on the Bulldogs for the final spot in the Island Division playoffs. Games in hand will factor in down the stretch, but for now the Grizzlies are 4 up on the Bulldogs. Victoria were last in action on Tuesday night, falling 2-1 in double overtime to the Nanaimo Clippers. The team has been inconsistent through the latter part of November, going win-loss-win-loss in their final 4 games. They’ve picked up just 3 wins in the 9 games since beating Powell River before Remembrance Day. First off, the game is on. Despite weather making it a pretty tough travel day for the Grizzlies today, we’re still a go for tonight’s puck drop. Victoria are going the “long way”, through Vancouver and up the Coast, so things may be pushed back a little bit depending on Victoria’s arrival, but a decision on that will be made closer to puck drop. Plan for a 7:15pm start. Interestingly enough, the only other time the Grizzlies have come to Powell River this season was that November 10th game where they were put through the washing machine from Vancouver Island to Powell River on a day not too unlike today. A 1 hour and 10 minute crossing lasted more than 2 hours as the Grizzlies made their way over. Whatever sea sickness there was didn’t last, a 5-2 win for the visitors that day. Finally on the weather. Not the first time in recent history these two teams (or at least 1) head along the Coast. Game 5 (of a 5 game series) in the 2013 playoffs was in Victoria after the Kings won game 4 to even the series at 2. A storm rolled in overnight after the Kings win forcing both teams to go bumper to bumper for 9 hours from Powell River to Victoria to play the deciding game…also won by the Grizzlies 3-2 in overtime. Final final thought on all this weather stuff….who says Cats don’t like water? Onto the game and the Kings will do it the hard way tonight, not due to injury, but due to missing 3 players for the Canada West selection camp in the Calgary area this weekend. Stefan Wornig goes for his 2nd tryout, while Kyle Betts and Carter Turnbull all make their debuts. If any of the 3 make the squad, they’ll be out of the lineup until after the Christmas break. It’s a double edged sword. The Kings are thrilled that 3 players are getting this opportunity and would dearly love to be without them until New Years, but it obviously created a few holes in the lineup. You’ll hear the word “opportunity” a bit tonight and potentially over the next couple of weeks. Victoria will ice a complete lineup tonight with a new addition from the last three games between these clubs. Jared Virtanen (cousin of Canuck Jake) was added by the Grizzlies late last month after asking for a trade from the struggling Calgary Mustangs of the AJHL. No points yet in 2 games against Alberni and Nanaimo. I talked a lot about discipline last weekend, with the Kings being the league’s least penalised team, the Capitals the most. This weekend is a bit of a flip on that, at least with the opposition. While the Kings remain the least penalised team (88 times shorthanded), the Grizzlies are equally saintly in 14th (105 TSH). Despite the lack of match practice, both team’s penalty kills come up successful more often than most. The Grizzlies are 3rd, the Kings 5th when shorthanded. The Kings have conceded 3 powerplay goals in their last 7 games, going perfect 4 times. It is very easy to draw some comparisons between this weekend and last weekend. Tell me if this sounds familiar as I describe the matchup this weekend. “A weekend double header against an Island Division opponent that the Kings haven’t beaten so far this season.” Last weekend the Kings faced that and put together a pretty complete effort on Friday, then got the job done despite some hiccups Saturday. The Kings aren’t thrilled with how they’ve played through 180 against Victoria so far, leading for just over 27 minutes of that time. The broadcast goes live on 95.7 Coast FM in Powell River at 6:55pm. It will also be online on the Kings Broadcast Network and FastHockey PPV. In our pre-game show we’ll talk with Kent Lewis on being without some pieces to the lineup, and an 0-3 series scoreline against the Grizzlies so far. In the 1st intermission, we’ll have chats with Canada West bound Stefan Wornig, forwards Austin Kamer and Tristan Mullin plus defenceman Jeremy LeClerc. In the 2nd break, a feature with BCHL Commissioner John Grisdale on his thoughts as we near the midway mark of the season. Brock Sawyer will join us after 60 in the post-game show with a player of his choosing. Having a bit of an issue with my Alumni Stat Pack workbook, so we’ll have to go another week without a stat update on your favourite former Kings. HOWEVER, this week has been a busy week for articles written on former Powell River players. Here’s some light reading to get you through another week. From the Regina Leader Post, talking about former captain JJ Coleshaw and his offensive touch. It was a side to his game that JJ showed in Powell River, particularly his efficiency in front of the goal. It’s a great look at his freshman season in the CIS. 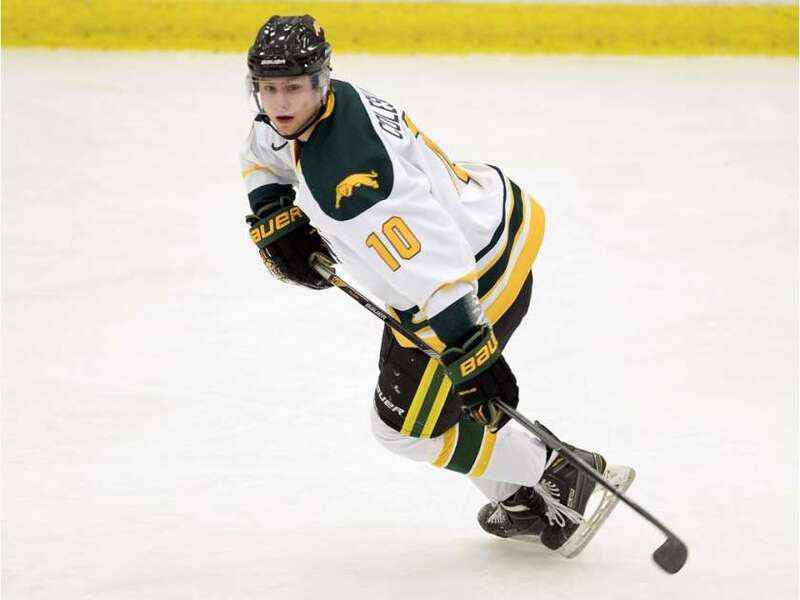 J.J. Coleshaw has caught a few people off-guard during the Canada West men’s hockey season. That includes his head coach. “He has surprised me the most out of all our rookies, just with the offensive skill he has,” University of Regina Cougars bench boss Todd Johnson said before Thursday’s 6-2 loss to the University of Manitoba Bisons at the Co-operators Centre. Coleshaw, a 21-year-old product of Clavet, joined the Cougars this season after three campaigns with the BCHL’s Powell River Kings. Stick tap to Kings trainer Brady Lake for forwarding this one to me. Former Comox Valley Glacier King and Powell River affiliate Derian Hamilton is with Penn State as a freshman this season. The defenceman was perhaps the best King on the blue line in the playoffs on most nights, scoring against Nanaimo in that decisive game 7 in the Island Division final. Freshman defenseman Derian Hamilton has stood tall during his first few months in a Penn State sweater. Hamilton has played in eight contests and has secured two assists for the Nittany Lions. Hamilton previously played in the Vancouver Island Junior Hockey League, splitting his time between three teams during the 2012-15 seasons. Notably, Hamilton was captain of the Comox Valley Glacier Kings in 2014-15. While the rest of the freshman class hails from the United States, Hamilton finds himself the lone Canadian player in the class of 2019. Finally, former King Daniel Carr recently earned a call up to the Montreal Canadiens. Carr is spending much of his time starring for the St. John’s Ice Caps in the American Hockey League after a season in the Canadiens system last year in Hamilton. Carr is wearing number 43 with the Habs. Former Union star Daniel Carr is getting his first chance in the NHL. 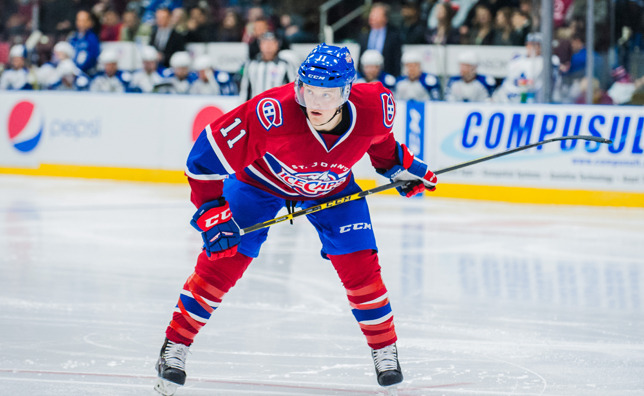 The Montreal Canadiens recalled the forward from their American Hockey League affiliate, the St. John’s IceCaps, on Sunday. Carr will be at Canadiens practice today, and he could make his NHL debut as early as Tuesday when Montreal hosts Columbus. The second-year pro was off to a solid start with the IceCaps. He’s fourth on the team in scoring with eight goals and nine assists in 21 games. Alex Rawnsley talks on a pair of Kings victories over the Cowichan Valley Capitals from the past weekend, some depth scoring for the Kings over the last 6 games and a preview of an upcoming double header against the Victoria Grizzlies.